E-commerce has emerged as the perfect blend of marketing and technology. Breaking the traditional pillars of retail and commerce, E-commerce has already incorporated one-tenth of the world’s retail revenue and shows no signs of stopping anytime soon. Hosting an E-commerce website used to be a monumental task with the technological constraints in place in the early days, but with the sudden surge in technological advancements, hosting an E-commerce website has become as easy as counting on your fingers. Amongst the plethora of organizations offering hosting services, one whose head pops out of the crowd is Magento.Powering Canon Store and Absolut Art, Magento has established itself as a game changer in the field of E-commerce hosting. The biggest advantage Magento offers is that it is an open-source project, which makes it highly customizable. You can make your website look and feel just as you envisioned it in your head, and Magento will help you do just that. Now if you’re hosting a website to sell your homemade cookies or your pottery, the first thing you have to decide is whether you want to host it on a common server or have a dedicated server backing you up. Quite plainly, a common server means shared resources with other website owners and a dedicated server ‘dedicates’ all its resources to your website. Sharing your resources is a good thing, but it has its drawbacks as well. This article will help you understand why a dedicated server is a better choice for your Magento hosted server. Let us just put it out there for you. Get a dedicated server the first chance you get. It does not matter if your business is small scale or an enterprise, getting a dedicated server should be your priority from the get-go. Here’s why a dedicated server will make your e-commerce website a roaring success. 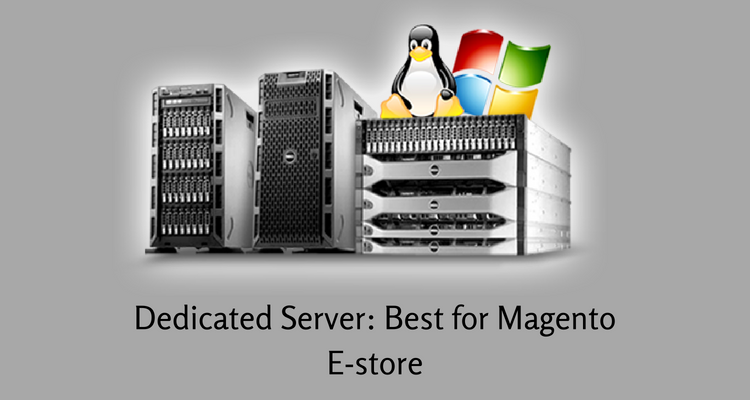 ● A Magento website on a dedicated server enhances the security of your website. Adding SSL authentication, DDoS protection, and password policies to your website when users sign in or sign up can increase your credibility as well as your sales. No one likes to get their data stolen. ● A dedicated server redirects all resources at your disposal, which in turn means a lag-free experience. Pages load and draw on demand, without waiting for resource allocation. A dedicated server also comes with a storage plan, which is beneficial when you are into customizing your website to the pixel. ● Server times are improved exponentially as there is no channel clogging while transferring information to the server. Response times are minimal to any amount of traffic which does not hamper business with your customers. ● Being an open source platform, Magento supports PSD to Magento conversion, which gives you the freedom to design themes from scratch in Photoshop and import them directly to Magento without any compatibility issues. This PSD to Magento conversion requires resources on demand to load at any given time or when requested to perform conversion and application tasks. A dedicated server does just that. ● Your hired Magento developer can provide 24/7 support on your website that is hosted on a dedicated server. This removes an overhead on maintenance of equipment and any unnecessary purchases that you might have to make. Sit back and watch your business grow, and let the experts handle the rest. ● It is useless to open a website if factors like IP rankings and SEO reduce your website’s rank and brings it down. A dedicated server provides a unique IP to your Magento hosted website, which will maintain your ratings on the internet and allow Magento to share your unique IP with SEO tools so that your website comes out on top. Having your website hosted on a shared server is cheap, but the sheer unpredictability and the tendency to create bottlenecks in functionality might end up making you spend more than you save. Dedicated servers not only serve your website exclusively but also provides a sense of security and proper maintenance ensures a 99.9% uptime. So, choose a dedicated server to host your Magento website on and watch your business reach new horizons.